We are pleased to present this book Absolutely Beautiful Containers, as shown and described by the publisher and author that may be of help to you around your garden. Because we have not read this book, we are unable to endorse it or provide you with any additional information. Container gardens are the hottest trend in outdoor decorating. 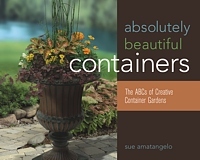 Sue Amatangelo takes the guesswork out of creating absolutely beautiful containers. Focusing on a progression of 200 container gardens—from simple one-item pots to large containers for a variety of plants—Sue's container garden recipes appeal to all gardeners. Her recipes incorporate new vegetative annuals, perennials, tropical plants, and even some evergreens. Absolutely Beautiful Containers details elements of design such as color, texture, height, depth, and plant needs for light and nutrients as well as ideas for holidays, seasons, and festive occasions. Each container design includes a plant list, planting diagram, and color photograph of the container in its glory. Be the envy of your neighbors with Absolutely Beautiful Containers.